Slovenian runner-up in Italian motocross championship. 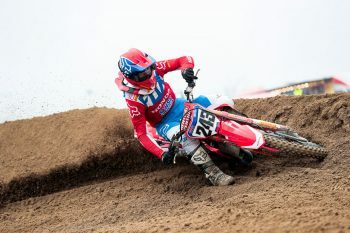 Former premier class world champion Tim Gajser believes he’s made step by step improvements throughout the 2019 Internazionali D’Italia, assisting in his pre-season progress as he plots his attack on the MXGP World Championship. The Honda HRC talent rose through the standings in the three-round Italian championship that attracted fellow world champions Antonio Cairoli (Red Bull KTM Factory Racing) and Romain Febvre (Monster Energy Yamaha Factory Racing), securing runner-up honours in the Superfinal classification after earning a fourth place result at Mantova last weekend. “Overall I’m quite happy with how these first few races of the year turned out,” said Gajser. “Riola was okay, Ottobiano was better and then Mantova was even better than that, so it was good to see step by step improvements each race. Cairoli captured his 11th premier class Italan motocross title at the weekend after dominating the series. The opening round of the MXGP World Championship will take place on 3 March at Neuquen in Patagonia Argentina.